The first time I had Kitchari was in India at the Ayurveda Retreat Center in Tamil Nadu. While I wasn’t doing a fast or Pancha Karma detox, I was offered, and delightfully accepted, the chance to try this highly satisfying dish. Kitchari (pronounced kitch-a-ree) means mixture, usually consisting of rice and beans. This staple Indian dish is cooked with a variety of spices and often includes vegetables. It can be made thick like porridge or more thin and soup-like. Perhaps best known for its use during fasting and cleanses, Kitchari is commonly used as a mono-diet to purify and detox the body. A mono-diet such as this allows the body to produce a limited amount of digestive enzymes and spend its saved energy on healing and purifying the body. A plain kitchari can be prepared and eaten as a mono-diet for 5-9 days to allow the digestive system to work less promoting greater restoration. Sometimes Kitchari serves as a great comfort food and a way to retune the body in a gentle, healing way. Often, I will layer the Kitchari with vegetables such as sweet potato and zucchini that add to the texture and flavor of the dish as well as boosting the nutrients and minerals. 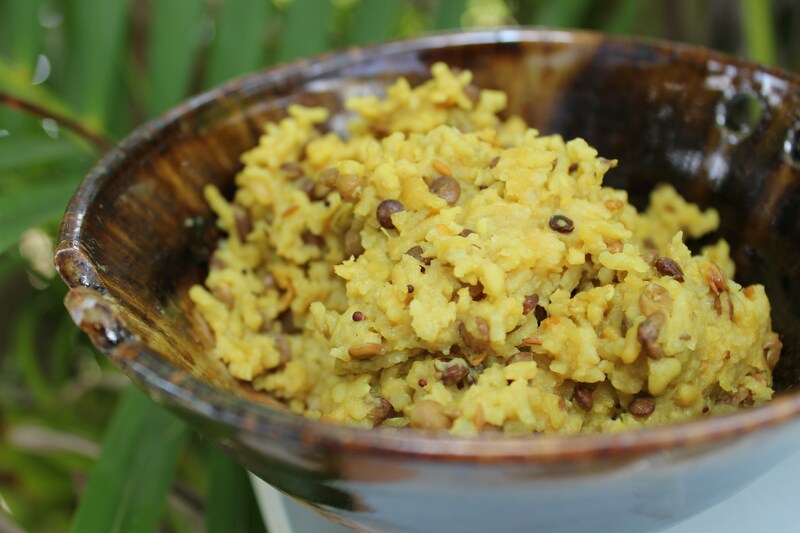 Traditionally, Kitchari is prepared using split mung beans selected for their tri-doshic quality and ease of digestion along with basmati rice. I chose to make kitchari using a medley lentils and savory spices. It is calming, soothing, and an excellent antidote to dietary excesses especially after indulgent holidays and celebrations. I recommend using Laurel Hill Lentil Medley, a lively and hearty blend of Petite Crimson, Golden, Black Beluga, Spanish Pardina and Ivory White Lentils. Soak lentils and rice separately for 1-2 hours with 1 inch of water to cover. This will help remove excess gasses. Heat ghee (or coconut oil) in a saucepan over medium-high heat. Add mustard seeds and cumin seeds until they become aromatic and begin to pop. Add the turmeric and coriander powders. Rinse the rice and lentils and add those, stirring quickly to blend and toast evenly, about 1 minute. Add the filtered water. Bring to a boil, cover and simmer for 20-30 minutes until all of the water is absorbed. Salt to taste. Good for all 3 Doshas. * Pitta- omit mustard seeds.